Two people died and several others were injured in a NYC car accident caused by a drunk driver who was speeding. 34-year-old Andrew Shakespeare was driving back from a wedding on Sunday morning. He had 4 other passengers in his car. He was allegedly drunk and was speeding on the Grand Central Parkway in Queens, NYC. As he approached the 188th street exit, Shakespeare changed lanes and side-wiped a Nissan Sentra driven by a 59-year-old woman. He then lost control of his BMW X5 SUV and careened into a Nissan Rogue driven by a 52-year-old man. Both cars crashed into the center guard rail. A 38-year-old woman driving a Mercedes was then struck by the BMW despite trying to swerve to avoid hitting the two cars. The impact sent her car into trees on the side of the road and back rolling over on the road. 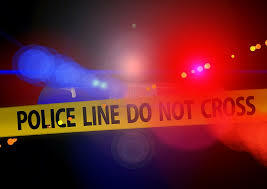 The BMW front passenger, 34-year-old Layon Campbell was transported to the hospital with critical head and body injury. He was pronounced dead upon his arrival. 16-year-old Akeam Grant who was sitting on the rear right seat of the BMW died at the scene of the accident. The two other passengers, a 21-year-old and a 16-year-old survived. One of them fractured his pelvis and his right arm. The other lacerated his right arm. They were both transported to a hospital to be treated. Among the people in the 3 other cars involved in the crash, both drivers of the Nissans were taken to the hospital for neck and back injuries but were listed in stable condition. The two passengers of the Nissan Rogue were also rushed to the hospital. The front passenger, a 50-year-old man injured his right leg. The rear passenger, a 63-year-old man fractured his rib and his neck. He also suffered from neck and back pain. Both passengers are in stable condition. The Mercedes-Benz driver was also transported to the hospital to be treated for pain in her right shoulder. A man died in a crash in Manhattan last Friday night. The 29-year-old driver of a 2013 Nissan Altima was speeding on the West drive of Central Park when he lost control of his vehicle. He jumped the curve and after crossing a grassy area he crashed into an oak tree 300 feet from the roadway. He was transported to the hospital where he was pronounced dead. The speed limit inside Central Park is 25 mph but according to witnesses the car was probably going at a speed of 60 to 70 mph. The accident occurred on Friday night around 11:30 pm. According to Park Drive Regulations, cars are only allowed on the West Drive weekdays between 8:00 am and 10:00 am. It is not clear why the man was driving on the West Drive of the Park at this time. A speeding young driver almost lost his life in a New York City car crash while his passenger only suffered minor injuries. The accident occurred on Saturday morning around 11:00 am. The 21 year old driver and his passenger were riding their car on the Bronx River Parkway near E. 173rd St. According to the New York Daily News, the driver was speeding when he clipped a taxi and lost control of his vehicle. He then hit the median and flipped several time across the parkway before landing on the grass next to the road. The car was totally crushed. Paramedics had to cut the car to remove the driver and his passenger from it. The driver who was critically injured was rushed to the hospital. The passenger miraculously only suffered minor injuries. 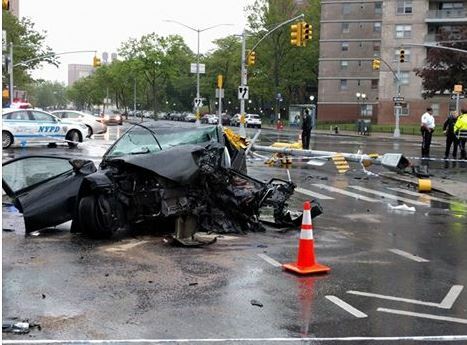 Two women were seriously injured in a car accident in New York City around 6:00 am on Tuesday morning. One of the women was driving a livery cab and the other one was her passenger. As the driver approached the intersection of Ocean Parkway and Neptune Ave in Coney Island she lost control of the vehicle and slammed into a utility pole. According to News12 Brooklyn a surveillance camera shows the car speeding just before the accident. The impact was so strong that the utility pole fell on the street. The front of the car was totally destroyed. The driver was badly injured and transported to the hospital in critical condition. The passenger was also inured and transported to the hospital in stable condition. A speeding driver blew a stop sign and crashed into a van with six passengers after which he ran by foot from the scene last Friday night in NYC. The car crash took place at the intersection of Shore Ave and Princeton Street, in Jamaica, Queens, NYC around 11:00 pm. 6 church goers were coming back from a service in a van when a rental car crashed into them. The impact was so strong that the van flipped upside down. The police believe the driver stole the rental car on a nearby street shortly before the accident. The passengers of the van were a pastor and his pregnant wife, their 3 month and three year old children, another family member and a teenager. Thankfully the 6 of them only suffered minor injuries. The police are still looking for the hit and run driver. 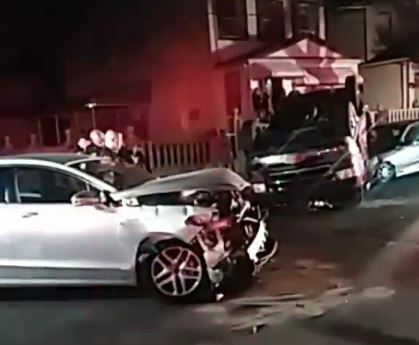 A man was injured in a car accident in NYC this morning after he lost control of his vehicle and slammed into a private house. 23 year old Shirley Lucas and her 2 year old daughter were inside their house located on Bruckner Boulevard near Thierot Avenue in Soundview, Bronx when the accident happened. The car first crashed through a metallic gate located at the entrance of the property and then hit the brick wall of the house. According to the NY Daily News The mother and the daughter weren’t injured but had to stay out of the house while Con Edison and the DOB were analyzing the damages. Below is a Google Map Street view of the location of the Saturday night accident.